The Gherkin Challenge Arrives, and it's AMAZING! It's finally here! The Day has arrived and what a day it is! Gherkin Challenge co-founder Francesca Valli and I arrive early for Adam Lewis' briefing of the NSPCC staff and find preparations in full swing everywhere - balloons being set up at the entrance; the Plaza being transformed into an event village - Hall of Fame ready, massage tables are up, the band unpacking their instruments, hula-hoopers on their way; boxes of Gherkineer Medals, Opies Mini-Gherkins and '360 at the Gherkin' books all heading to the top; NSPCC volunteers and 30 St Mary Axe security staff all ready to go and people are starting to arrive in their green vests! Early in the morning the London Gay Men's Choir pose for a picture (too many for a selfie) before entertaining people all day long. My son arrives in the last wave of the day, along with my husband, the two teams from the Daily Telegraph (Travel and UltraTravel) and lots of family and friends, really great to see everyone (couldn't chat much though - still signing books!) Delighted to say that the St John's Ambulance people had nothing to do except smile and encourage people to drink water at the top. My family and friends about to conquer the Gherkin! With the lovely Fred Hoffman who came over from Paris - thanks Fred! 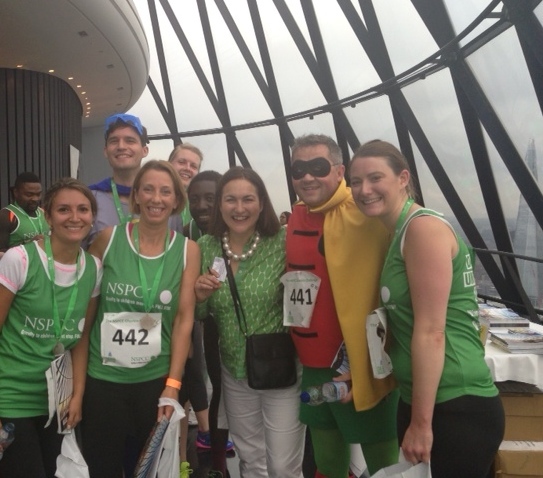 Thanks to everyone who participated in the 2014 Gherkin Challenge for the NSPCC and to all the many, many people who supported it and made it possible. You all did something AMAZING TODAY! PS - We have already beaten the event fund-raising target of £150,000.. the NSPCC will announce the final total when all the sponsorship money is in.